Robin’s soothing music makes the heavenly realms accessible to the earthbound and transports us to a tranquil world free of worry and struggles. Medical practitioners, massage therapists, hypnotherapists, healers, and other body workers use Robin’s tranquil music to soothe and relax their patients. Individuals achieve a deeper level of meditation. PERFORMING ARTIST, COMPOSER, and SONGWRITER Robin Miller has surrounded himself with music since he was a child. Born and raised in Detroit, Michigan, Robin began playing the guitar at the age of 7, started his first band at age 14, and composed and recorded his first album before he turned 18. Robin Miller has recorded albums with various artists for labels such as A&M, MCA, and RCA. Proficient on guitar, keyboards, bass, and mandolin, Robin loves to demonstrate his versatility through rock & roll, blues, new age, and many other types of music. His music receives airplay on cable radio and FM stations across the USA and Canada, and musical streaming through DMX and MUZAK satellite channels. 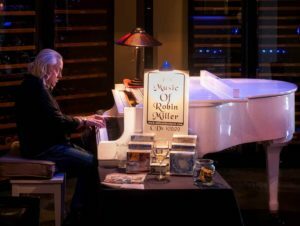 Currently living in Sedona, Arizona, Robin performs locally and continues to create new composition, always stretching his musical gift to new heights.